Hi-Temp Glass Filled Nylon wheels are meant for high temperatures such as bakeries and ovens. These Wheels can withstand up to 550F intermittent (1 hour), and 475F continuous. Hi-Temp Glass Filled Nylon wheels are meant for high temperatures such as bakeries and ovens. These Wheels can withstand up to 550F intermittent (1 hour), and 475F continuous. These wheels are impervious to most chemicals, solvents, oils, salt, alkaline and water. Glass Filled Nylon are made for Wet and Corrosive environments where Water or Harsh Cleaning Chemicals including some mild acids are used. These wheels are very light but have a heavy load capacity due to the strength of nylon. Hi-Temp Glass Filled Nylon Wheels are reinforced with glass fibers for added strength. Please select either plain bore or a stainless bearing for applications that include, steam cleaning, wash down, grease, oil, or exposed to blood, salt, or any type of solvents. We typically sell these to many type of laboratory applications as well as animal clinics. These are used in Surgical rooms as well during operations where chemicals and blood are commonly exposed. 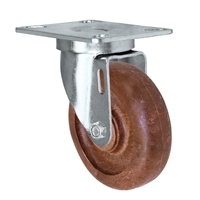 You can also find these type of wheels being used in Schools, Cafeterias, and many Food Service Industries, Medical Industry Carts, Hospitals, Labs, and Bakeries. 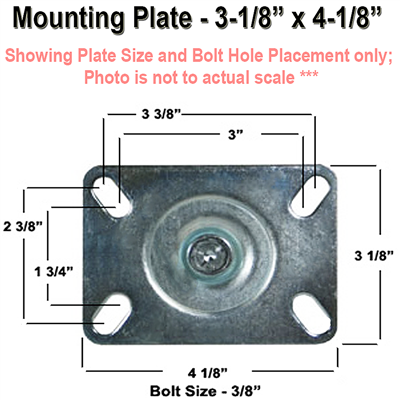 4" x 1-1/4" Hi-Temp Glass Filled Nylon Wheel | Swivel Caster | Capacity: 350 lbs | Plate Size: 3-1/8" x 4-1/8"
5" x 1-1/4" Hi-Temp Glass Filled Nylon Wheel | Swivel Caster | Capacity: 350 lbs | Plate Size: 3-1/8" x 4-1/8"